San Diego is full of holiday celebrations and festive parades to get everyone in the Christmas spirit. With all the local parades and parties going on around town, here are our top picks for what to do during the holidays in San Diego. Enjoy the annual parade of marching bands, community groups, vintage cars, horses, and more as they proceed through downtown La Jolla. Cap off the event with the annual holiday festival and tree lighting ceremony. Witness the seaside parade of seasonal and festive lights as boats and yachts sail through both Mission Bay and San Diego Bay, decorated with holiday lights and twinkling décor. The Dana is well-known as being a dog-loving property…why wouldn’t we want to watch pets strut their stuff? On December 16th, check out the Vet & Pet Gaslamp Holiday Parade where owners and their costumed pets watch as pooches and felines strut their stuff in the Gaslamp Quarter in San Diego’s downtown area. Owners and their costumed pets will compete at a Pet Expo to win the title of the best-dressed pet. 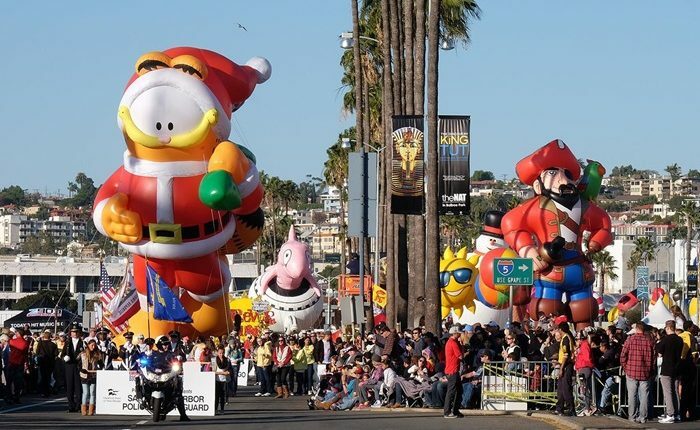 Feast your eyes on the massive balloons floating past the San Diego Bay at the Annual Port of San Diego Holiday Bowl Parade- America’s largest balloon parade! The waterfront streets will come alive with over 100,000 street-side spectators gathering to enjoy this nationwide event in celebration of the Holiday Bowl game day.